The Osterley Park Summer 10K is back for its sixth anniversary race on Saturday 15th June 2019 and entries are open. The Osterley Park Summer and Winter 10K are organised by Ealing Half Marathon CIC, the team behind the award-winning Ealing Half Marathon, in partnership with The National Trust. 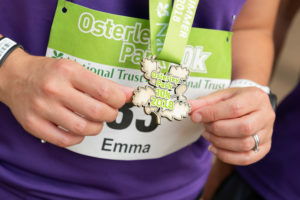 The Osterley Park Summer 10K is set in the grounds of the beautiful National Trust Osterley Park, one of the largest open spaces in West London. Suitable for all abilities, this is a fast and friendly race, perfect for those seeking a 10K PB or those looking for a starting challenge. The flat route takes in the stunning scenery surrounding the lakes and includes a loop of the private gardens. As runners make their way through the colourful gardens, they can spot the original Robert Adam summer house full of lemon trees and scented shrubs. The route takes runners down the tree-lined drive, past grazing Charolais cattle, before heading through the surrounding private gardens, park and farmland of one of the last surviving country estates in London. The race is the official recommended race for Alice’s Youth Music Memorial Fund. Entry costs £20 for affiliated runners and £22 for non-affiliated runners, and includes chip timing and a finisher’s medal. Runners must be a minimum entry age of 17 of race day. There are also plenty of volunteer opportunities at the Osterley Park 10K. Go to www.osterleypark10k.co.uk for more information and to sign up to the Osterley Park Summer 10K. You can also follow the event on Facebook and keep up to date with the latest news on Twitter.